I visited Orlando, FL from March 30 with Dr. Yoneda, Dr. Kometani, and Dr. Sawada who belong to the division of Endocrine and Hypertention, department of internal Medicine, Kanazawa University. Our purpose was to participate in two endocrine meetings. First, we participated in the International Aldosterone Conference which was held March 30-31 in The Rosen Centre Hotel. Many Specialists in Primary aldosteronism gave us a lecture on the latest basic and clinical research. On March 30, I presented the poster presentation. The title of my poster presentation was "Immunohistochemical and Genetic Analysis of Aldosterone Producing Adenomas Demonstrating Discrepancy Between Pre- and Post-ACTH Diagnoses in Adrenal Venous Sampling". I stayed with the poster during the poster session, answered other doctors’ questions, and discussed with the subject of my study for two hours. I was surprised because how to present a poster presentation in the U.S. was different from Japan. In Japan, we present for three minutes and answer some questions for two minutes according to a chairperson among audience. So I was very nervous, but managed to present my presentation. Next, we participated in the 99th Annual Meeting of the Endocrine Society which was held April 1-4 in Orange County Conference and Exhibition Center. I listened to many endocrine experts’ lectures during the meeting. On April 2, I presented the poster presentation which was the same contents as I did in the International Aldosterone Conference. I was honored to be selected for a featured poster by the Annual Meeting Steering Committee. This was the first time that I had participated in overseas meetings. I had a good experiences for me. I am grateful to the persons who gave me this opportunity, Dr. Yoneda, Dr. Kometani and the staffs of Medical Innovation program. I visited Orlando, FL from March 30 with Dr. Yoneda, Dr. Aono, and Dr. Sawada who belong to the division of Endocrine and Hypertention, department of internal Medicine, Kanazawa University. Our purpose was to participate in two endocrine meetings. In our laboratory, we are working on the basic and clinical research of Adrenal Disease. 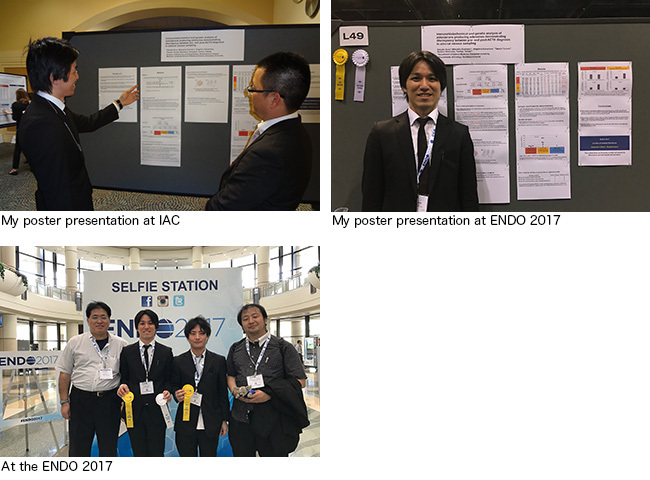 In IAC and ENDO, many doctors joined from all over the world. We could get the good opportunity to share research of each other with many specialists and collaborating doctors. Especially, it was very important that we discussed the international clinical trial which starts this year. It remains many problems to be solved in the field of adrenal disease. In this trip, many latest researches inspired me. I would like to make steady efforts to do a research which has a great influence on researchers and clinicians in the world. Last, I am grateful to the persons who gave me this opportunity, Dr. Yoneda and the staffs of Medical Innovation program. Copyright © Kanazawa University., All Rights Reserved.